Submitter: [This] was in the library of my high school, a large school in a wealthy suburb, until May of this year! 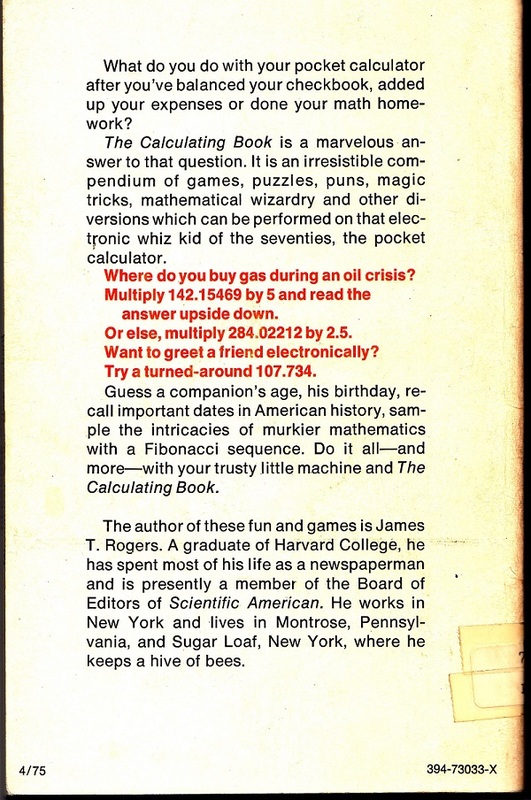 This book promises to teach tricks for calculators. However, there is a lot of talk about “overloading” the calculator with large numbers, like anything over eight digits, or giving it “lockjaw” (Huh?). Most modern calculators can handle at least twelve, and some can go even higher by displaying in scientific notation, so that’s no longer very accurate. There are some tricks that involve that thing where you flip the calculator upside down to spell words. Sadly, it does not mention that venerable classic of the calculator alphabet genre, 55378008. Graphing calculators, (i.e., the calculators most likely to be owned by the kind of people who find this stuff amusing) have moved away from the traditional seven-segment display and thus don’t make those letters anymore. Holly: A reasonable choice for libraries in 1975, but this particular high school can probably do better. Kids are more interested in playing 2048 or Candy Crush than spelling 55378008 on calculators. 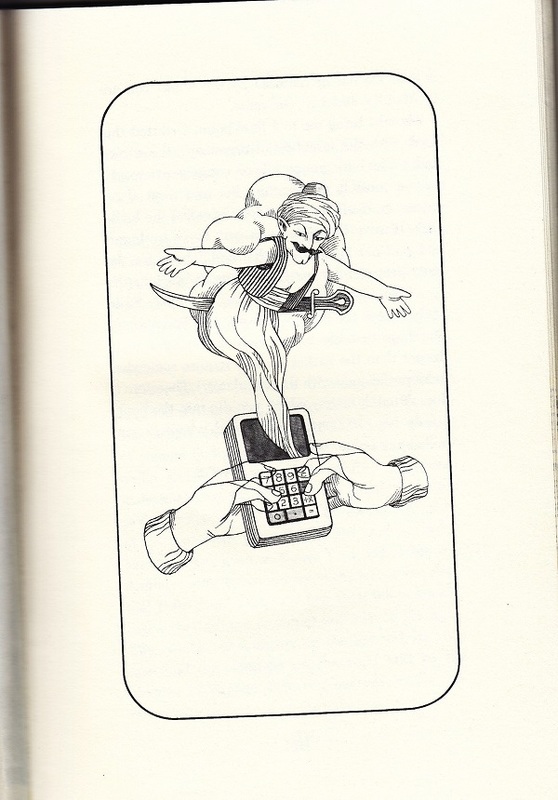 (Above) Submitter: The illustrations are goofy, too. If you don’t know how it works, then genies. (Above) Submitter: I think this was after a riddle where the answer was 710 (oil). 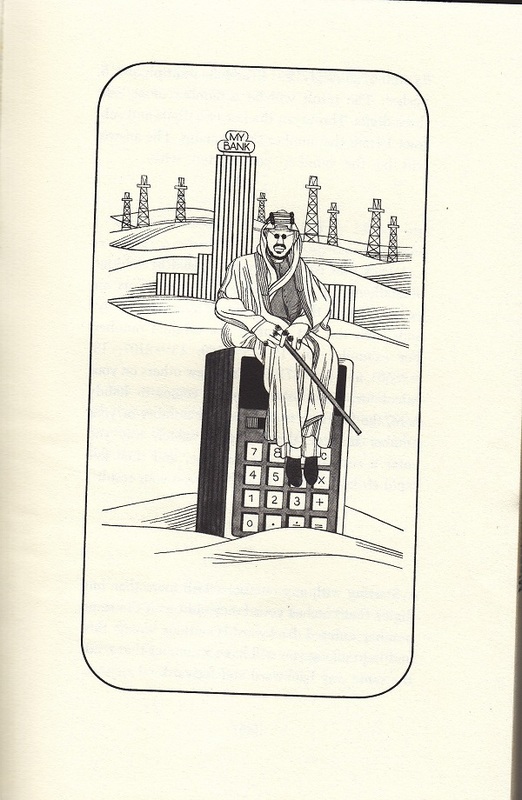 At first I thought with the cane and round sunglasses that he was supposed to be a blind guy as well as an oil sheik. Oh, wow, I would have loved to have had this book when I was little! 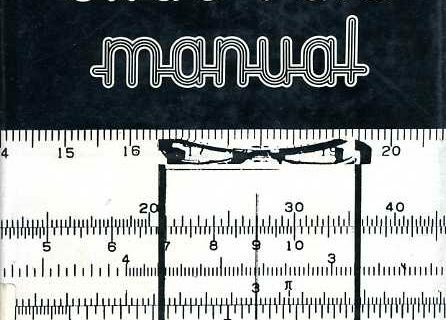 TI used to make excellent manuals for their calculators in this style (particularly the original TI-30 and TI-55), and I read a bunch of them back in the 1980s. 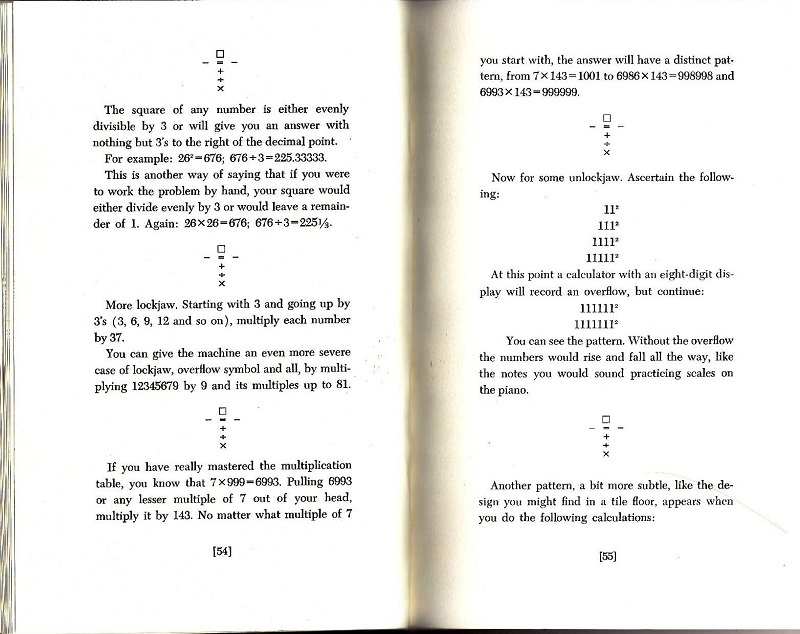 Also, I presume the “lockjaw” the author is talking about is from a failure mode on early pocket calculators: Instead of saying “Error” or lighting the E symbol in the display, they’d just freeze until you with hit C or cycled the power. I’ve only read about calculators that old, though; they’re quite a bit before my time. I think I DID have this book when I was little! I kind of miss a lot of stuff from the early days of electronics. But yeah, not many people are going to have any current use for this. Ah, yes. 55378008. Endlessly charming and clever. By the time we were in high school, we had the TI graphing calculators that came with all kinds of games, including one where you had to sell drugs. I think it was called “Drug Lord”? Very educational. Probably an adaptation of drugwar.exe, which has been passed around endlessly. If it’s the same one, you had to jet between the five boroughs of NYC and keep the range of prices for various controlled substances in your head. Yeah, that was it. You started selling quaaludes and none of us in 2004 knew what the heck those were. Holy cow, I weeded this from our library when I first started! It was in the board games section, not the math section. ? The first calculator I used had about 4 functions and plugged into the wall. It was a couple of inches thick. Sorry, that link didn’t work. Here it is! I remember checking this book out (more than once) from my local library! It was loads of fun back in the days when calculators were fascinating new technology. 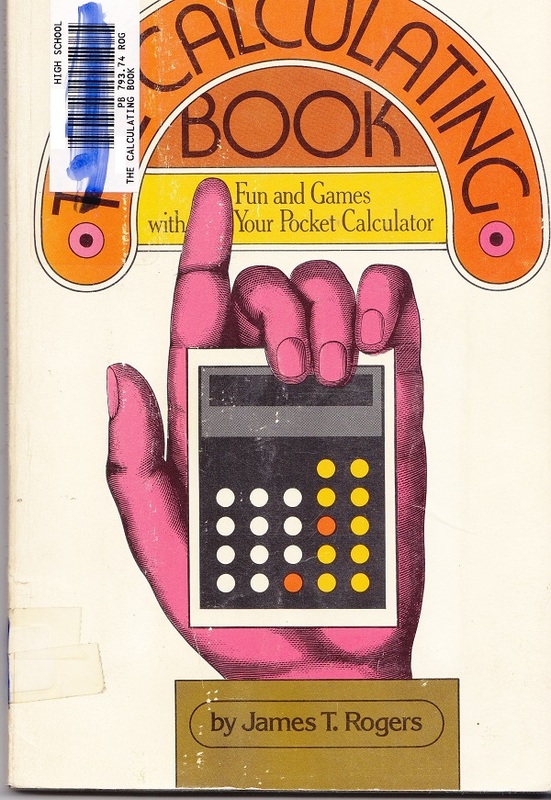 I still own a vaguely similar book that came free with the first calculator I owned. Which sort of tells you how expensive calculators were at the time.